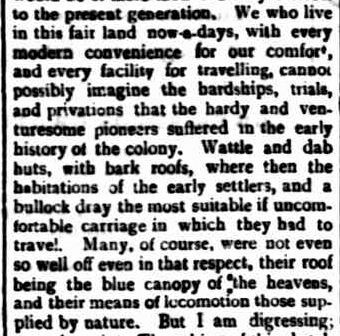 April Passing of the Pioneers reminds me how much can be learnt about Western Victorian history from reading pioneer obituaries. This month sees some prominent men of 19th century Western Victoria, James Dawson, James Thomson and John Kirby. I am also learning more about the wonderful homesteads dotted throughout the Western District. The Monivae, Longerenong and Mt. Koroite Homesteads are all mentioned this month. 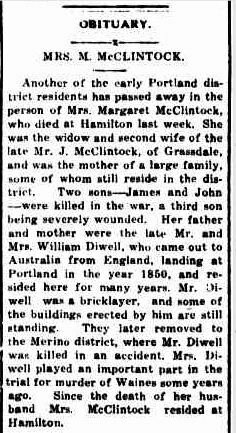 If you click on the homestead name in the obituary, the link will take you through to the Victorian Heritage Database and relevant homestead’s listing. James DAWSON: Died 19 April 1900 at Camperdown. James Dawson was born at Linlithgow, Scotland in 1806. His mother, Johannah Park, was a niece of explorer Mungo Park. James left Scotland in 1840, bound for Victoria. He initially purchased a property on the Upper Yarra at Melbourne, but later bought a property at Port Fairy. He erected a house he had brought in pieces from Scotland. The property was known as Kangatong Estate. While there, he commissioned artist Eugene von Guerard to paint nearby Tower Hill. He sold the property and moved to Keilor then Camperdown. After two years away in Scotland, James returned and was appointed Protector of Aboriginals, a role that saw his greatest contribution to Victorian history. He was also an honourary superintendent of the Society for the Prevention of Cruelty to Animals and amateur taxidermist. A large collection of his taxidermy was presented to the Museum connected to the Melbourne Mechanics Institute. William BAILEY: Died 25 April 1906 at Ballarat. Born in about 1828, William arrived in Victoria in 1848. He went to Ballarat during the gold rush and remained there until his death. he Ballarat papers were speculating at the time of his death the value of his estate, thought to be £400,000 thanks to mining and squatting. He had a number of children who had been successful including Stephen who was a station owner at Orange N.S.W. The boys were also good cricketers. Margaret Bennett MARTIN: Died 22 April 1909 at Portland. The wife of Mr Francis Findon Levett, Margaret Martin was eighty-five years old at the time of her death. She had been in Victoria since her early teens. She had many stories about the early days of the Portland district. James ALGIE: Died 17 April 1910 at Stawell. Jame Algie was a veteran of the Crimean War. He was born in Glasgow around 1832 and joined the 71st Highland Light Infantry from Glasgow in 1849 and served in Greece and India. 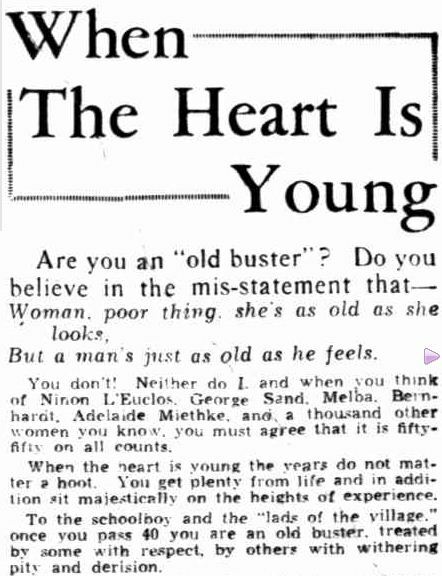 He lived in Stawell for forty years. Thomas CLOHESY: Died 24 April 1910 at Hamilton. Thomas Clohesy had been in Victoria since in 1871. He made the journey from Ireland with his father and brother, but sadly his father passed away on the voyage. He at one time worked at the estates of the Chirnside brothers. James THOMSON: Died 25 April 1910 at Hamilton. James Thomson was born in Balnachole, Scotland in 1823. He and his wife travelled to Australia in 1852. With him, he brought sheep farming experience which he tried, first at Edenhope in a partnership and later at Hamilton at the well known Monivae estate. James purchased Monivae in 1870 from the estate of Police Magistrate Acheson Ffrench. The property was 18,000 acres and James ran Angus cattle and Lincoln sheep. The Victorian Heritage Database lists he also bred rare Scottish ponies, collie dogs and goats. I have an interest in the history of the Monivae property and it’s homestead as I attended Monivae College in Hamilton which, for a short time in the 1950s, ran the school from the homestead before moving to the current site. The school retained the Monivae name. At school, we learnt a lot about Acheson Ffrench, the original owner, but I knew nothing of James Thomson’s links to the homestead. Ffrench named Monivae after Monivaea Castle, his father’s castle in Galway, Ireland. I discovered, thanks to the Victorian Heritage Database, that James Thomson built the existing Monivae homestead, known as “Old Monivae”, rather than Ffrench. Ffrench had lived in another home on the property and it was later left empty by Thomson. The bluestone for the new homestead was taken from a quarry on the property. 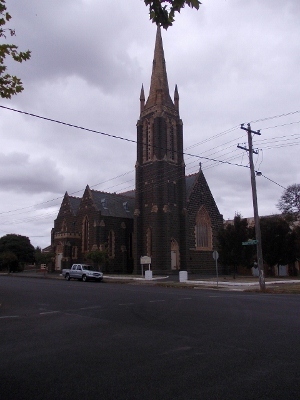 James also donated bluestone for St. Andrew’s Presbyterian Church, which stands with the Hamilton Anglican Church on Hamilton’s “Church Hill”. Their spires are landmarks on the Hamilton skyline. Nana and several other Haddens were married at the Presbyterian Church. James INGLIS: Died 12 April 1914 at Ballarat. James Inglis ran the Ballarat coachbuilding business of J. & J. Inglis. with his brother John. His father started the business in 1860 after he took his family from Melbourne to Ballarat. James was just three at that time. The original business was at Market Square but later moved to nearby Creswick Road. Robert DALGLEISH: Died 12 April 1914 at Learmonth. Robert Dalgliesh arrived in Ballarat around 1850 from his native Roxboroughshire, Scotland. He tried his luck on the diggings, brought property with his brothers, then returned home to Scotland in 1856. In 1860, he was back and bought a property at Learmonth, Salwick Hall“, from his brother. It was there he died in 1914. William UREN: Died 19 April 1914 at Berringa. Before travelling to South Australia with his wife during the 1860s, Cornish born William spent time in Chile, South America. He and his father worked in silver mines. While in South Australia he worked in the copper mines before moving to Ballarat. He was a shift boss at the Midas and Lone Hand mines. Agnes LUNDY: Died 16 April 1916 at Horsham. Agnes came to Australia from Scotland during the 1860s and worked for Sir Samuel Wilson at Longerenong near Horsham. That is where she met her future husband, William McClintock. William was a cousin of Sir Samuel and worked as an overseer at Longerenong. They remained at Longerenong for some time, before William bought land and bred find woolled sheep and thoroughbred horses. 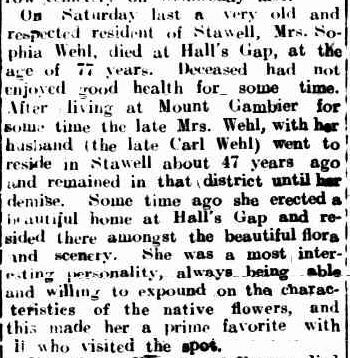 Sybil GAIN: Died 28 April 1921 at Horsham. Sybil Gain was ninety years old at the time of her death and was one of the Horsham district’s oldest pioneers. She arrived in Victoria from Scotland during the 1850s. She married three times. Her husbands were John Morrison who she married at nineteen, William Knipe and John Gillies. 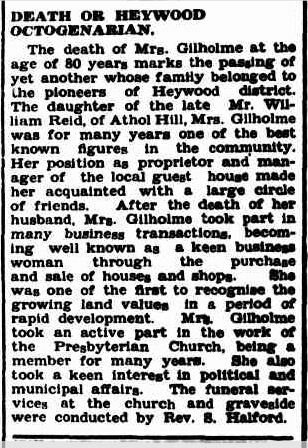 Gillies was a pioneer of the flour milling industry at Horsham while Sybil was a foundation member of the Horsham Presbyterian Church. John RUNDELL: Died 19 April 1925 at Condah. Born in Cornwall around 1840, John Rundell was a well-known member of the Condah community. He arrived as a child aboard the Birmingham with his parents and spent time with his father at the Ararat goldfields. He married Matilda Hardy upon his return. Matilda later died and John married Agnes Willling. John was a road contractor and spent many years building roads between Portland and Hamilton for the Shire. Catherine HANLEY: Died 12 April 1929 at Hamilton. 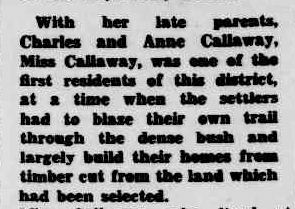 Catherine Hanley was an early pioneer of the Portland district, having arrived in Adelaide around 1856 from Donegal, Ireland. It was in Adelaide that she married her husband, James Ball in 1858. They then journeyed to Portland where James farmed. After the death of James Ball, Catherine moved to Hamilton. 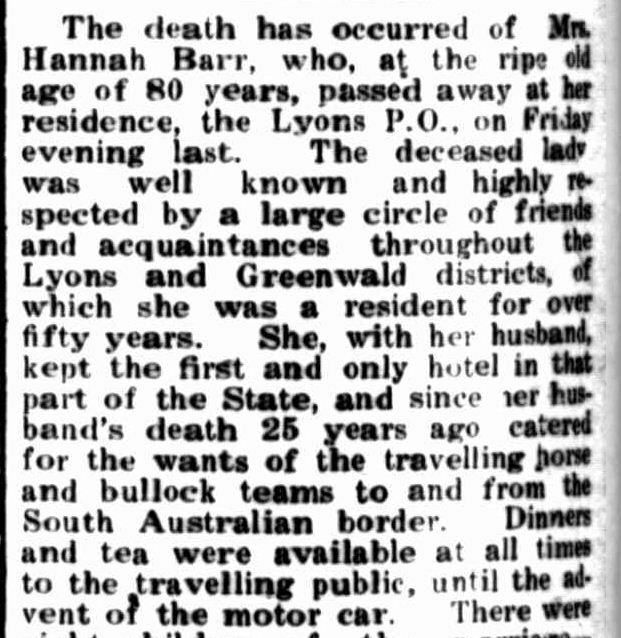 Hannah HATHERELL: Died 13 April 1934 at Lyons. Hannah Barr would have had some great pioneering stories to tell. She and her husband ran the first and apparently the only hotel in the Lyons/Greenwald area. Mrs John MOLLOY: Died April 1934 at Hamilton. Mrs Molloy was born in England and travelled to Portland with her parents aboard the Flora McDonald. While in Portland she knew Stephen, Edward and John Henty and had many stories to tell about them. She moved with her parents to Coleraine and after her marriage she moved to Hamilton. She was a devout Roman Catholic and crocheted an alter cloth for the St. Marys Church, Hamilton. Eliza CALLAWAY: Died 3 April 1942 at Maryborough. Eliza was the daughter of Charles and Anne Callaway and was born in Amherst, Victoria in the mid-1860s. 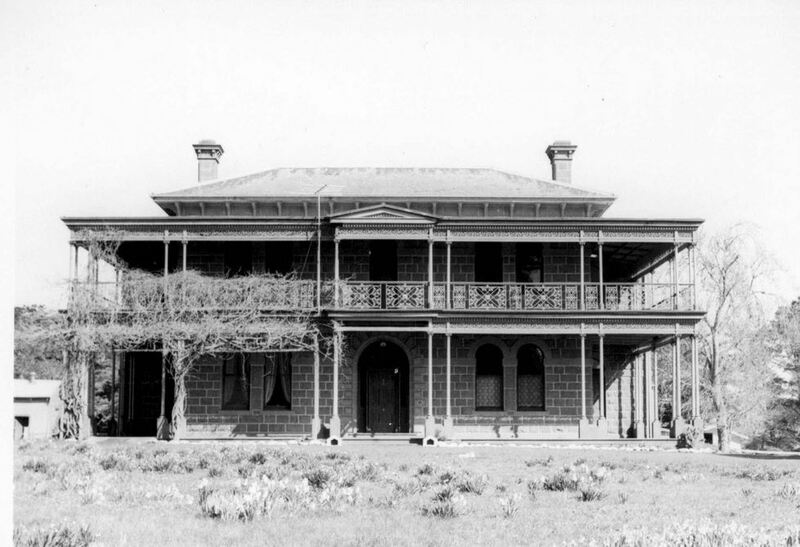 During the 1870s, the Callaways moved to the Heytesbury Forest near Timboon where Charles selected 240 acres. He cleared the land and grew hops until red spider began destroying the crops. John Finn KIRBY: Died 7 April 1942 at Portland. John Kirby was quite a man. Born at Springbank Casterton in 1858, he completed his schooling at Ballarat College. He then worked for seven years as a stock and station agent in Ballarat, before returning closer to home in 1882 to work as a stock and station agent at Coleraine. He eventually bought the business. Among his many positions around the district, he was both a Councillor and three time president of the Wannon shire. He was a chairman of directors of the Western District Butter Factory Ltd. and a Justice of the Peace. John was a talented sportsman and excelled as a footballer, including a stint in the metropolitan league. Probably his greatest sporting achievement was as a racehorse owner. His horse The Parisian won the 1911 Melbourne Cup. He also had success with a steeplechaser, Napier which won the Great Eastern Steeple at Oakbank, South Australia and the Grand Annual Steeplechase at Warrnambool. John Kirby married Elizabeth Crowe in 1885. They resided in the Mt. Koroite homestead overlooking the Coleraine racecourse. The Victorian Heritage Database mentions extensive renovations to the homestead after Parisian’s success in the Cup. Robert Arthur LIGHTBODY: Died April 1949 at Drik Drik. Robert Lightbody was the third son of the wonderful Rebecca Kitson remembered in the January Passing of the Pioneers. Robert had fine clerical skills and was a Justice of the Peace, secretary of the Drik Drik Butter factory, Drik Drik P & A Society, Drik Drik school, Drik Drik Repatriation commitee and the Drik Drik cricket club. As if wasn’t busy enough, he was also a local preacher of the Methodist church for sixty-five years. His wife, Ellen Jones, must never have seen him. 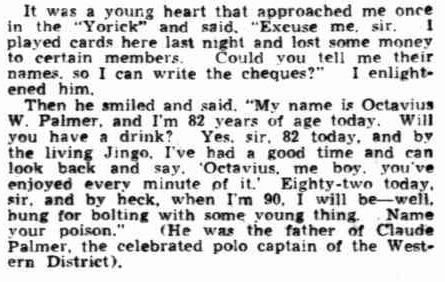 All that activity must have contributed to him living to the ripe old age of ninety-three.